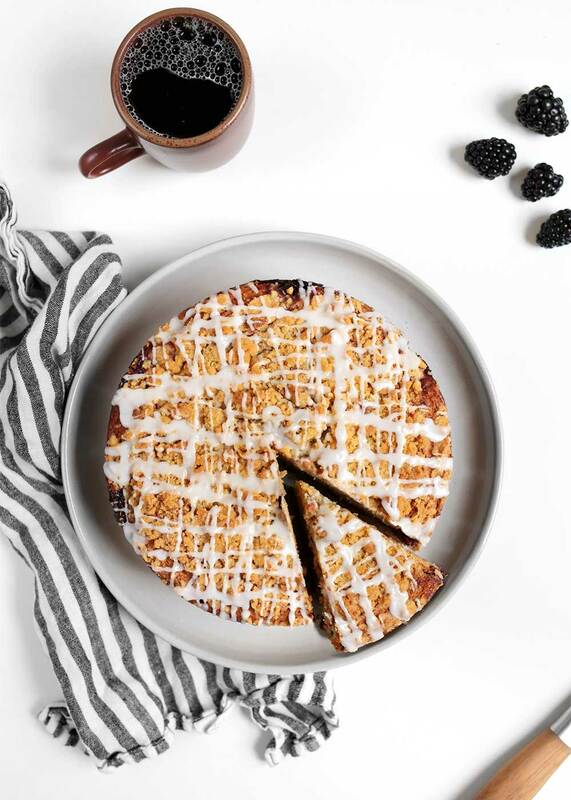 A 4-part coffee cake composed of a sour cream cake, a stripe of blackberry thyme, a crumbly streusel, and a messy glaze. Best made the day before serving. Preheat oven to 350°F. Line the bottom of an 8-inch cake pan with parchment paper. Set aside. Note: this is best made the day before serving. Place all the streusel ingredients in a small bowl. Set aside and allow the butter to warm up slightly while you compile the coffee cake. Prepare the blackberry thyme filling. Rinse the berries and drain. In a small saucepan add all the blackberry thyme ingredients. With the heat on low, simmer for about 5 minutes, crushing the blackberries once they soften. Begin making the coffee cake. In a stand mixer fitted with a paddle attachment, cream together the butter and sugar on medium-low speed until well combined (about 5 minutes). Meanwhile, in a medium bowl, whisk together the flours, thyme, baking powder, baking soda, and salt. Set aside. Once the butter mixture is ready, add eggs one at a time, scraping down the sides of the bowl in between additions. Add the sour cream and vanilla, still beating on medium-low speed, until evenly combined. With the mixer on low, add the flour in 3 additions until just combined, scraping down the bowl as needed. Batter will be dense. Into the prepared cake pan, add a thin layer of batter to cover the bottom of the pan. Carefully pull the batter to the edge of the pan to create both a seam and a bowl. Remove the thyme sprig from the blackberry mixture and pour evenly over the bottom layer, trying to keep the mixture from touching the edge of the pan. Add dollops of remaining batter and carefully smooth to the edge. Don't worry if some of the soupy berry mixture pops through. It's too be expected. Set aside. Massage the streusel ingredients into a crumble and top the cake. Bake for 45-50 minutes, or until the center is baked through. Once the top is throughly browned, about 30 minutes in, tent with foil. Remove from oven and allow to cool for at least 15 minutes before removing from pan. Carefully run a thin knife around the edge of the pan to loosen. Remove from pan and place the cake on a cooling rack. Allow to cool completely before frosting. Make the glaze once the cake has cooled. Whisk together the powdered sugar and milk until smooth. Drizzle over cake. Allow glaze to harden, about 5 minutes, before serving or storing. Store covered for up to 3 days.